A study carried out by the Sunscreen Guide by Environmental Working Group (EWG), a Washington-based non-profit organisation, concluded that only 8% out of the 500 sunscreen products they looked at were any good. An earlier investigation by the same organisation found that of nearly 1,000 brand-name sunscreens, four out of five don‘t adequately protect consumers and many contain harmful chemicals. The group says that some of the nation‘s leading brands, including Coppertone, Neutrogena and Banana Boat, are the poorest performers. EWG has again flagged products containing oxybenzone (a hormone-disrupting compound that enters the bloodstream through the skin), as well as products making exaggerated/unsubstantiated claims, and products containing vitamin A compounds (found in 41% of sunscreens and may speed up skin damage and risk of skin cancer when applied to skin and exposed to sunlight). Disturbingly, some of the worst products in EWG’s “Hall of Shame” were Baby sunscreens. Do Sunscreens Protect Us From the Sun? The active ingredients of sunscreens are compounds that absorb, reflect or block ultraviolet light. Sunscreens are regulated in America by the Food and Drug Administration not as cosmetics but as over-the-counter drugs. They’re rated based on their Sun Protection Factor (SPF); the higher the SPF, the better the protection against sunburn. High SPF products however, typically provide minimal protection against the sun’s UVA (ultra violet light type A) radiation. This type of sunlight is thought to be responsible for considerable skin damage and cancer, but does not burn. 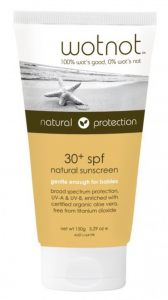 The Environmental Working Group says that the SPF rating on a sun product is only part of what consumers need to know, and that the biggest problems with sunscreens are that they don‘t offer appropriate protection against UVA damage and that many contain unsafe ingredients. A study in the April 2004 Journal of Chromatography found that there was significant penetration into the skin of all sunscreen agents they studied. This is of concern as slathering a potentially damaging, carcinogenic agent onto your skin may in fact be worse for your health than ingesting it, as it goes straight into your blood stream. By following experts’ recommendations to apply generous amounts of sunscreen protection every few hours to prevent skin cancer, you are likely to be absorbing a fair amount of whatever ingredients are in your sunscreen. Making matters more confusing, scientists are not even sure whether sunscreen prevents against melanoma in the first place. They’ve suggested that many sunscreens may prevent sunburn, but may fail to actually protect against cancer because most sunscreens only screen out UVB, which helps your body make vitamin D, not the UVA that causes most of the damage. Some studies have even found a link between melanoma and the use of commercial sunscreen! Additionally, potentially harmful chemicals are often included in commercial sunscreens, such as dioxybenzone and oxybenzone, and are some of the most powerful free radical generators known to man. Other studies have linked specific chemical UV filters with the transsexualization of male fish and coral reef degradation. In light of this information it is imperative to do your homework, and to ONLY use a natural sunscreen with safe, non-toxic ingredients, so as to not add to your toxic load. As you may still not be protected from damaging UVA, also make sure you remember hats, shirts and shade as part of your summer routine. For decades now, we have been warned about how dangerous and damaging the sun is. We’ve been told that it will cause wrinkles and age us prematurely, and that too much exposure will greatly accelerate our risk of cancer. The answer for all sun lovers out there – Sunscreen, and plenty of it. While it’s true that you want to avoid sunburn and skin damage, the ingredients used in most commercially available sunscreens are questionable at best. As you’ll see, many of them can cause more damage than they prevent. There are solutions, however, for those times when you need to limit your sun exposure. After all, summer is coming into full swing, with beach and pool outings being planned by many. EWG has researched many types sunscreen and Emed has also analysed many all-natural, non-toxic sunscreens and the best of the best seem to be Wotnot SPF30 Sunscreens. Octinoxate (Octyl Methoxycinnamate) The most widely used sunscreen ingredient, known for its low potential to sensitise skin or act as a photoallergen. Oestrogenic effects are noted in laboratory animals as well as disruption of thyroid hormone and brain signaling. Has been found to kill mouse cells even at low doses when exposed to sunlight! Oxybenzone (Benzophenone-3) Associated with photoallergic reactions. This chemical absorbs through your skin in significant amounts. It contaminates the bodies of 97% of Americans according to Centers for Disease Control research. Health concerns include hormone disruption and cancer. Octisalate Octisalate is a weak UVB absorber with a generally good safety profile among sunscreen ingredients. It is a penetration enhancer, which may increase the amount of other ingredients passing through skin. Avobenzone Primarily a UVA-absorbing agent, sunlight causes this unstable ingredient to break down into unknown chemicals, especially in the presence of another active, Octinoxate. Octocrylene Produces oxygen radicals when exposed to UV light. Homosalate Research indicates it is a weak hormone disruptor, forms toxic metabolites, and can enhance the penetration of a toxic herbicide. Micronized Titanium Dioxide Sunscreens with micronized titanium dioxide may contain nanoparticles. Micronized TiO2 offers greater sun protection than conventional (larger) particles. These small particles do not penetrate skin but may be more toxic to living cells and the environment. Inhalation of powders and sprays is a concern. Micronized Zinc Oxide Same as Micronized Titanium Dioxide, above. Titanium Dioxide Appears safe for use on skin, due to low penetration but inhalation is a concern. Ensulizole (Phenylbenzimidazole Sulfonic Acid) Known to produce free radicals when exposed to sunlight, leading to damage of DNA, this UVB protector may have the potential to cause cancer. Nano Zinc Oxide Nano zinc oxide offers greater sun protection than larger zinc particles. Comparatively little is known regarding potential health effects of nanoparticles. They do not penetrate healthy skin, and thus appear to pose a low health risk in lotions. Inhalation of powders and sprays is a concern. Nano Titanium Dioxide Same as Nano Zinc Oxide, above. Zinc Oxide Zinc has a long history of use in sunscreen and other skin care products; little absorption and no adverse health effects are reported. Emed recommends sunscreens that use Zinc Oxide as their primary agent. Padimate O (Octyl Dimethyl PABA / PABA Ester) A derivative of the once-popular PABA sunscreen ingredient, research shows this chemical releases free radicals, damages DNA, has estrogenic activity, and causes allergic reactions in some people. Menthyl Anthranilate One study found that it produces damaging reactive oxygen species when exposed to sunlight. Mexoryl SX 2 hours of sunlight can degrade as much as 40% of this active ingredient. Low skin penetration. Methylene Bis-Benzotriazolyl Tetramethylbutylphenol Not an approved active ingredient in the U.S. Few studies exist on this chemical. It is photostable and does not absorb through your skin. Sulisobenzone (Benzophenone-4) Can cause skin and eye irritation. Does not penetrate your skin to a large degree, but enhances the ability of other chemicals to penetrate. Benzophenone-2 Not approved for use in United States sunscreens. Concerns about hormone disruption. Fortunately, there ARE all-natural ways to protect yourself from sunburn that you can use instead of resorting to the toxic infusions of commercial sunscreens. The most obvious and safest option is to find some shade and cover up with a shirt and a hat once you’ve reached your limit of sun exposure (you can tell you’ve had enough right when your skin turns the lightest shade of pink). Instead of chemicals and potentially toxic compounds, each active ingredient in these outstanding products have been carefully chosen to specifically protect and nourish your skin. In addition to UVA/UVB-reflecting zinc oxide, it contains only all-natural ingredients. In a study recently published by Nutrition Reviews, Dr. Niva Shapira has shown that a diet rich in antioxidants and omega-3 fatty acids may make fun in the sun safer this summer. A diet, similar to the diet eaten in Mediterranean regions where melanoma rates are extremely low, can help protect us from sun damage and skin cancer. The sun’s rays damage both skin and the immune system by penetrating the skin and causing photo-oxidation, affecting both the cells and the body’s ability to repair any damage. Include a colourful, healthy diet and supplementation as part of your sun smart regime to fight the oxidizing effect of the sun. Few health recommendations have had as damaging an effect as the advice that you should never leave your house without sunscreen in the sense that wearing sunscreen effectively blocks your body’s production of vitamin D, which happens naturally when your skin is exposed to sunlight. In fact, sunscreens reduce vitamin D production by as much as 97.5 to 99.9 percent. The widespread acceptance and adoption of this doctrine has contributed to severe vitamin D deficiency on a grand scale, which in turn may lead to many other common diseases, types of cancer and deficient immunity. It is important to get your vitamin D levels checked and supplement if necessary. Click here to view Emed’s Best Vitamin D Supplements.